Kapenguria Heroes from West Pokot and Plateau Queens from Kisumu finally got to live their dream when they flew to London to train with football great Victor Wanyama. 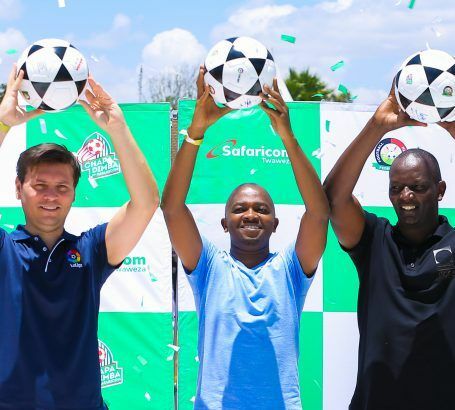 The two teams emerged winners at the finals of the prestigious Chapa Dimba na Safaricom football tournament that ended last month, earning them a five-day trip courtesy of Safaricom. Each team also pocketed a KES1 million cash prize. Wanyama is Harambee Stars Captain and also plays for the English Premier League team Tottenham Hotspurs. Last Sunday, they were treated to a Premier League game between Tottenham and Leicester City FC. They later trained with Wanyama before concluding the trip with a tour of the city. The tournament has already opened up doors of opportunities. More than 20 players will be joining the U20 National team and the Kenya Premier League. “…David Majak, Fredrick Krop, and Oscar Kengwa have signed for Kenya Premier League teams, whereas James Omsinde and John Njuguna have been called up to the National U20 team,” said Nick Mwendwa, President of the Football Kenya Federation.